Well this is a fun end of the year surprise! Soh Moriyama has shared some rough layouts from when the Digimon Adventure Blu-ray box was being planned. At the same time he posted these he expressed condolences for the recent passing of Toshiko Fujita, so sharing them may have been his own way of sharing something related to her since Taichi features prominently. 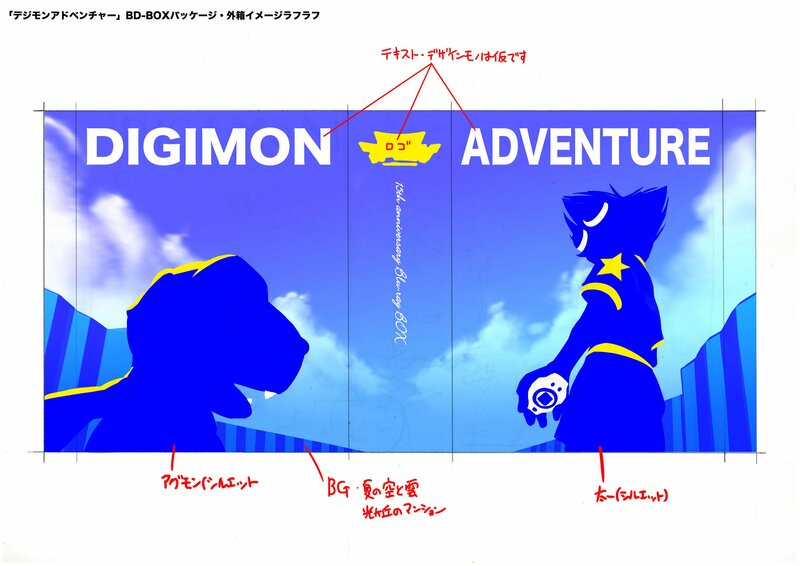 The first image above identifies itself as "Digimon Adventure BD-Box Outer Packaging Illustration Rough Plan". The text at the top with 3 lines coming out pointing to elements of the box are explaining that the text and design elements are temporary. The text over the logo silhouette just says 'logo' to point out it would be replaced with the proper show logo. 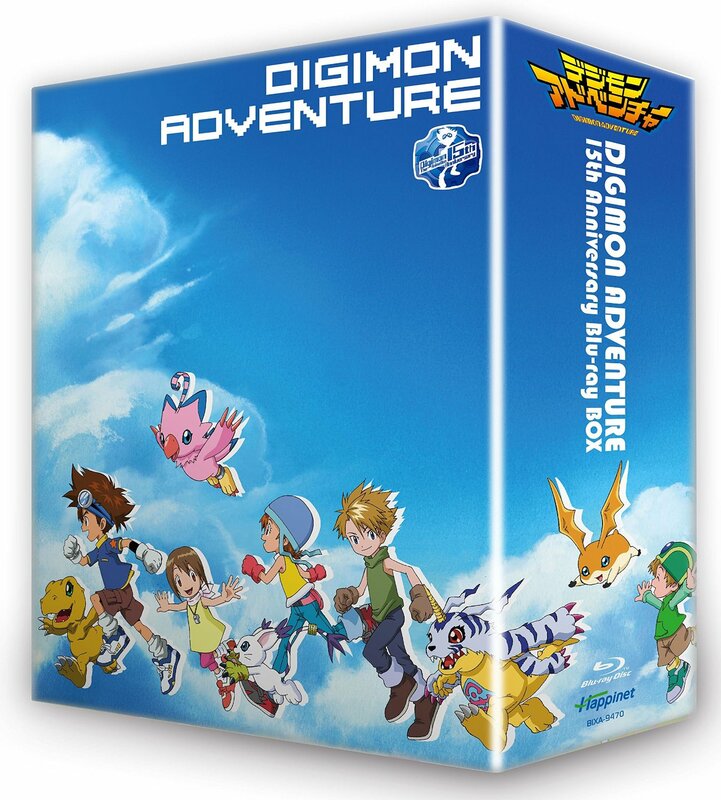 The 2nd image is labeled "Digimon Adventure BD-Box Package Design Memos" and is dated September 8th, 2014. This is a little over a month from when the Blu-ray box was publicly announced. Idea A is the same design from the first image, while Idea B use a similiar blue box idea for the inner box, but having the kids falling through a digital space like in the opening to the anime for the slipcover. Underneath both design roughs there is various text for core elements of the packaging for the Blu-ray box. Clear Skies (blue) and clouds (white), logo (orange). Image uses these 3 colors as a base. Package Design will have 'Digimon Anime Masterpiece' text in blue. Upcoming Digimon 02 box will be based on red instead. Meant to give an image of entering the Digital World once you open the packaging. The chosen children and their partner Digimon face off with the powerful 'boss Digimon'. Interesting, neither of these early designs ended up being used for the final box (which we have a breakdown of here), although various aspects mentioned in these planning documents made it to the final box. 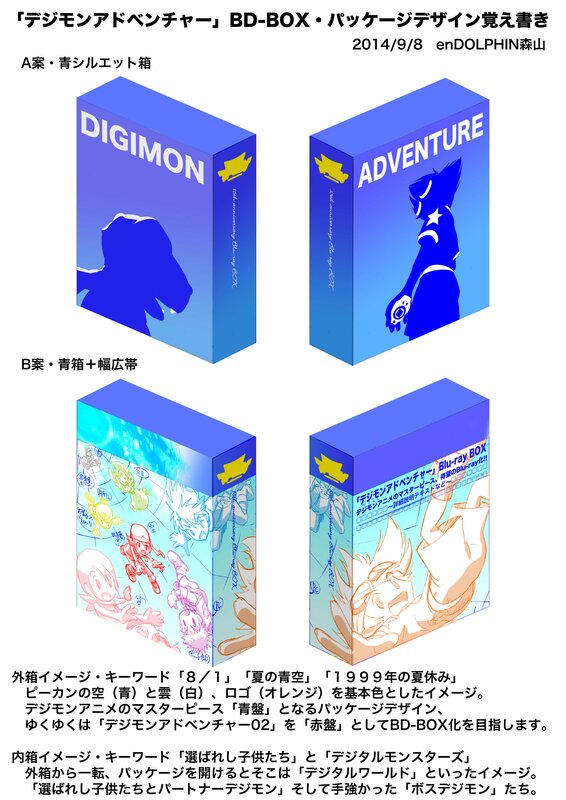 It's an fun look at a couple of Digimon Adventure Blu-ray box designs that never were. Thanks to garm for translations. I wish they would re-dub the first season more accurate to the JP version and release it on blu-ray here in the states. That would be cool! Does anyone know if the Tri US releases have been selling well? And they went with boring stock images and unused space for the final design? Man, what a waste. The designs are nice but I can also see why they didn't go with them. I do like minimal silhouette Designs but Adventure isn'T really a series that really lends itself to that style. Plus only having Taichi and Agumon on the cover would just be a bit too one sided. The second design could have been nice... really looks similar to what the tri posters did but maybe that was the reason the box didn't end up using it. The images were made for the Blu Ray box and haven't been used since. I'm not sure what about them could be considered "stock images". I guess more "generic" than stock if they were made specifically for the box. Not that I'm opposed to reproductions of the style (the Tamers BD did an amazing job) but these were pretty boring. I mean... the Tamers box is effectively (overall) the same thing. Both are the kids and Digimon running. Adventure has them running sideways around the box, Tamers has them running towards the screen. But the Tamers box is a whole piece with a central focus, here it's just the kids photoshopped onto a blue sky background. I dunno, maybe it's the white dropshadow they're using, but Adventure's box feels way more slapdash than Tamers. Yeah not gonna lie I think the boxart with the kids falling looks loads more creative and would have looked better than "Cast lineup on sky background". It honestly looks like something I could have whipped up in like 30 minutes in photo shop. Just line up the characters, give it a white 'shadow' slap that over a plain background, add text and BAM done. The falling art looks so dynamic and gives a better feel of 'Kids thrust into an Adventure'.